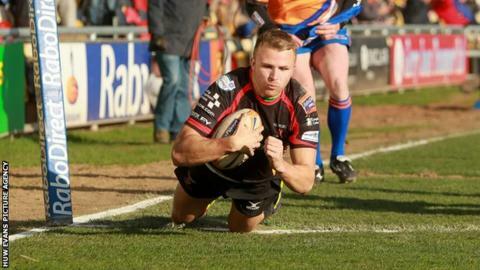 Newport Gwent Dragons wing Tom Prydie and centre Ashley Smith have signed three-year contract extensions with the Welsh region. Prydie, 22, who has five Wales caps, and Smith, 27, are key members of the Dragons squad. Director of rugby Lyn Jones is pleased they have re-signed at Rodney Parade. "I am delighted that both Ashley and Tom are extending their contracts with us for another three seasons," Jones said. "Ashley is an integral part of the squad here at Rodney Parade and has proved to be a strong and natural leader both on and off the pitch. "He has had a great season with us and I look forward to working with him over the seasons to come. "Tom has shown great promise throughout his time with the region and I am looking forward to working with him over the coming seasons. "He delivers and responds to everything the coaches and I throw at him. He has great potential as a player and I hope he realises that himself."